I am from from Germany and since 1 year owner or a Saiga 12 Police shotgun. From the beginning there are problems with ejecting the shells. I tried some methods to solve the problems (other recoilsprings, polishing bolt, other ammunition .......) problems remained. Now I measured the gas puck and the boring on my Saiga. There was a clearance of 0,23 mm. Another Saiga Police which i compared had only a clearance of 0,05 mm. Could this large clearance be a reason for the ejecting problems ? From which material is the origianal puck ? It is magnetic. Does it make sens to manufakture a puck from Titan oder stainless-steel ? You could make one out of whatever you wanted, but you are probably going to need to keep the weight and dimensions of the puck very close to the weight of the original piece. I would make it the same weight and diameter as your friends gas puck. You would think over time, if the gas puck diameter was the issue, that when the gas block got really dirty, that your S12 would begin to cycle better as the carbon build up filled in the gaps. Have you checked your gas ports? Have you checked to see if your gas ports are obstructed? There are 5 gas ports and they are continous. There was no improvement when I shot for a longer time. 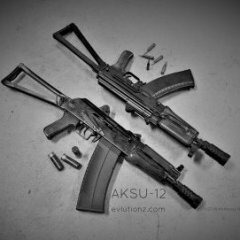 Compared to the other Saiga 12 police i discovered that at my Saiga much more gas/dirt went past the piston. At first I will manufacture a puck from mild steel. I seems the origninal Saiga-puck is also from similar material. Also, there are several other after-market pucks available, you don't need to reinvent the wheel. Does your shotgun have the adjustable gas plug in front or the fixed gas block with the integral front sight? It is a fixed gasblock, no adjustment possible. If your friend's puck is the same design, try it in your weapon before you make another one. If it makes a positive difference, make one like it. Aftermarket pucks here in the US are usually made from stainless. 5 ports is good, but diameter could be an issue. Does the version you have come with the feature that disables the gun if the stock is folded? I am wondering if that could be introducing friction to the system. No, it also functions when stock is folded. Problem soveld 😁 it was the too small puck.